Cryptocurrency has been embraced as a form of payment by various industries and brands. To the joy of crypto enthusiasts that have a knack for wagering, the sports betting scene has also taken a like to digital currencies. A former fiat sportsbook, 1xBit, converted to Bitcoin payments, instead of just adding the coin to its list of currencies. The platform has the most versed and extensive list of sport and events in the crypto betting market. But this is not a Bitcoin-only bookie, as it’s supporting deposits and withdrawals in more than 20 other coins such as Ethereum, Litecoin, and Monero. Each sport features an abundance of betting categories. In addition to the plethora of sports and betting options, users are also able to live bet on various events. 1xBit features an online casino, virtual games and a lottery, which makes it a versatile platform for any kind of player that wishes to try out his luck or skill by wagering on sports, events, or games. The platform is divided into various betting sections according to the sport of interest, and the latest member to join the family is a section dedicated entirely to UFC. Ultimate Fighting Championship (UFC), a renowned mixed martial arts promoter, has spread even further. This expansion includes TV channels and is reaching entirely new markets in Australia, Asia, Europe, and the UnitedStates. UFC has garnered a great deal of mainstream media coverage for its top fighters and matches. It has attracted the attention of both media and sports fans. 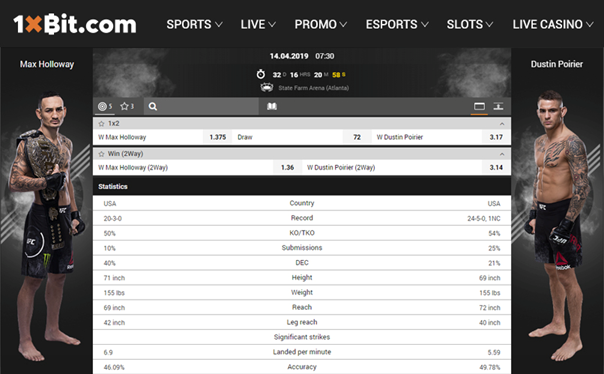 Taking into account this increase, 1xBit created the section to cater to the betting needs of UFC followers. Wagering platforms are not always seen as trustworthy or fair by the general community. This is because, in several instances, they have been proven to be unfair and greedy to the point of manipulating the players through fake odds and stats to intentionally make them lose. Bookies that use distributed ledger technology through the implementation of cryptos can provide a solution to the issues of unfairness and deceit. Crypto transactions are always recorded on their respective chains, and all the stored data remains there forever, without the possibility of ever being modified or deleted. Slow transactions can also be remedied by incorporating DLT, as cryptocurrencies midway third parties for financial settling are not in the equation. The sign-up process with traditional bookies is long, tedious and involves revealing personal information. But registering for an account on 1xBit is the complete opposite. In order to create an account on the platform, the user just has to provide an email address and select the preferred currency account. The are no personal details, no long forms or complicated verification times. Just one click and a password and the user ID will be generated and sent to his/her email. By enabling the two-factor authentication feature for their account, users do not have to worry about security breaches. Blockchain can bring a great number of advantages and improvements to a number of problems which are currently in the betting industry. Crypto projects first started to branch out by partnering with brands and companies that were somehow close to the technological sector. But why remain confined to only one audience? The world of sports welcomed digital coins and their adoption movement. Last year, the Litecoin Foundation paired with Ultimate Fighting Championship (UFC) in order to increase the coin’s market visibility. This partnership made Litecoin the first cryptocurrency to be included in a UFCfighting ring. Litecoin’s contribution to the UFC scene for this year involved sponsoring Ben Askren, a UFC 235 fighter. 1xBit covered in its blog post a similar case on this topic which took place on February 23rd. The Stratis blockchain project offered to sponsor boxer James DeGale in his match for the Super-Middleweight award. Stratis (STRAT) is a platform which is specialized in offering services needed to create and deploy decentralized apps (dApps) for private blockchains. The blog features a news section for those interested in the latest happenings in blockchain and sports, as well as guides that offer help for various setups or bets. UFC fans which are also crypto enthusiasts can access the 1xBit site to find out more or to place a bet on their number one contender. The post The Bets Are on Blockchain: 1xBit appeared first on Global Coin Report.